Two main versions of this piece exist. One version shows the animals with hats, and in the other version, the animals do not have hats. 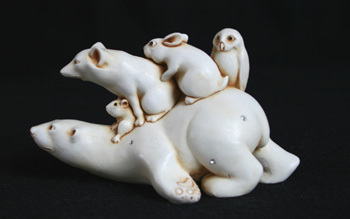 In addition, there are 25 rare variations of the version with hats which depict only the polar bear. The bling version without hats vary in the color of the crystals on the polar bear. There were 80 with clear crystals, 50 with peridot crystals, 50 with aqua crystals, 30 with amethyst crystals, 20 with topaz crystals and 20 with red crystals.